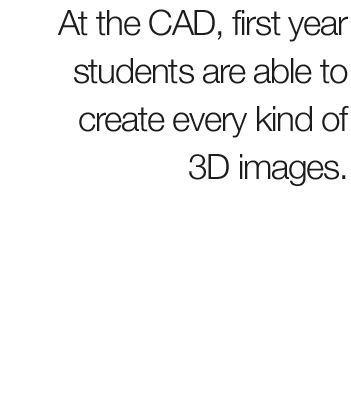 During this year, students learn to create various types of “fixed” 3D images with different software, including 3ds Max, Photoshop and After Effects. After graduation, they can then work in design offices (spatial planning, town planning, architecture, interior architecture, product and furniture design), advertising agencies, digital agencies, photography studios, animation studios (to create 3D sets), TV studios (to create virtual sets for television channels), real estate development companies, etc. Students who choose to undertake this short programme will build a portfolio that will offer them many opportunities as 3D is increasingly present and sought after. Note: The prerequisites for drawing and Photoshop are very important because the objective of this training, ie to be able to create, in one year only, high quality 3D images is a real challenge. Those who do not have the appropriate level in drawing and / or Photoshop must first follow the PREPARATORY year at the CAD before entering the 3D Image Design programme. At the end of this unique year, the student presents his final project and his best work of the year to a jury of professionals qualified to deliver the CAD diploma. A one-month internship in a 3D animation studio, a photography studio, a town planning office, an (interior) architecture office, a digital agency, a real estate development company, etc. to complete during the Easter period.